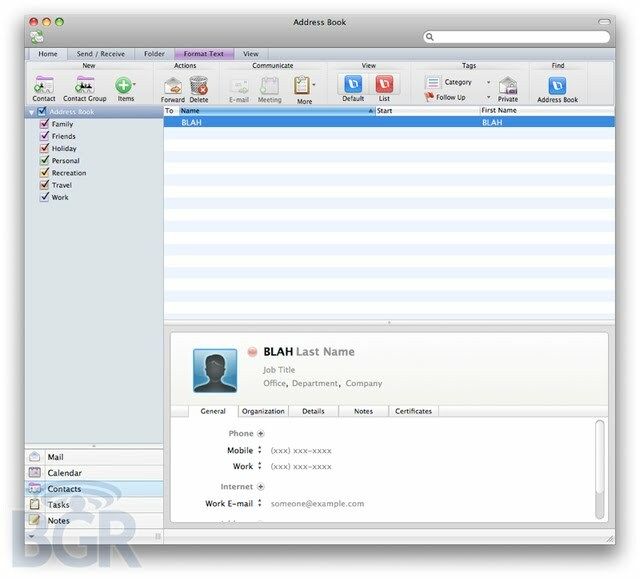 Boy Genius has revealed the screenshots of Microsoft Office 2011 for Mac. The screenshots consists on major development of Microsoft Office 2011 applications of Outlook, Word, Excel, and PowerPoint 2011. The appearance of Microsoft Office 2011 are much like Office 2010, Ms. Office 2011 for Mac includes the ribbon on every application and with several new functions are also integrated in it. Ms. Office 10 was lack of Outlook but this will also be the first time Outlook will be available in the Office Suite for the Mac. 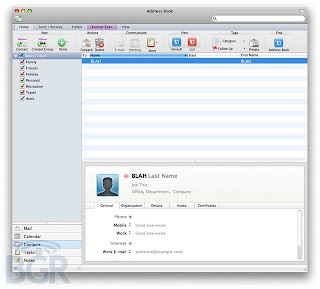 The appearance between Outlook for Windows and Mac appear to be similar, including a mail preview pane, calendar, contacts, tasks and notes available for use. The screenshots also show a quick search in the toolbar for Outlook, Excel, and Word, for searching within your inbox, spreadsheet, or documents. Office 2011 is also said to include the same multi-use feature that Office 2010 includes, allowing for you and your co-worker to work on the same document at the same time.